June 2, 2017 — Links International Journal of Socialist Renewal reposted from International Viewpoint — Activists from the Liga Unitaria Chavista Socialista (LUCHAS, Unitary Socialist Chavista League) gave their opinion on the call for a National Constituent Assembly made by President Nicolás Maduro on May 1, 2017 in his speech at the celebration of International Workers’ Day. The aim of the statement is that hopefully comrades from other revolutionary organizations and political personalities, with whom they have been sharing some orientations and positions about what has been happening in Venezuela and in our continent for some months now, decide to adhere to the present declaration. They consider this a document that they make available for discussion, to the various revolutionary political organizations that exist and to the vanguard that has made it possible to move through this Bolivarian and Chavista process. In order to argue their position on their participation in the call for an ANC, they have considered it essential to refer to historical elements which lie at the origin of this unresolved dispute which in 2017 has taken on dangerous dimensions of violence that seem to grow ever wider. (D) the emergence of modern Venezuelan parties (AD, COPEI, URD, PCV) in the context of the global dispute between fascism and Stalinism, impelled the construction of imaginaries of freedom, progressivism and change, mediated by oscillations between a social democracy faltering before capital, and a bureaucratic perspective of revolutionary socialism. A discourse conditioned by the diatribe between fascism versus Stalinism made possible the construction of authoritarian imaginaries in the dynamics of modern Venezuelan parties from their inception. The appropriation of the oil income, to concentrate capitalist profits through import, caused four great waves of abandonment of the countryside, within a framework of city-country opposition where the rural was synonymous with backwardness and the city with progress. The first phase occurred in the initial attempts at democracy with their dictatorial intermediaries (1936-1958), the second in the framework of the struggle against the peasant guerrilla war in the 1960s and the third, in the context of the oil price boom of the 1970s. A fourth wave, with an already decimated peasant population, occurred in the last two decades of the twentieth century. In all these periods and processes, the capacity for national agricultural production was practically destroyed, and the so-called industrial plant was nothing more than a gigantic machinery for capturing oil income, through the development of mechanisms for importing inputs, parts and almost finished products, which generated exorbitant profits and to some extent concealed its nefarious implications in the capital-labour relationship and the generation of this sui generis surplus value. The model entered into crisis as a result of the impact of the global oil price crisis of the 1980s, the crisis of the foreign debts of the dependent countries and the slowdown of the world economy, in the same period. The so-called Venezuelan Black Friday caused the lumpen Venezuelan bourgeoisie to begin a rapid process of transferring the consequences of the capitalist crisis in this period onto the backs of the working class and the salaried professional groups. Uncontrollable inflation generated by the impact of the devaluation of the bolivar against the dollar, and its immediate transfer to the goods, products, goods and services imported by the lumpen bourgeoisie, generated a brutal fall in the purchasing power of wages for the vast majority of the population . It was a clear sign that the Venezuelan economy was tied to the chariot of imports and that only a very small layer of what the population required was produced in the country. The deterioration of the standard of living was so rapid that it produced a great malaise in the Venezuelan population that incubated the popular revolt of February 27- 28, 1989. This popular insurgency highlighted the exhaustion of the rentier-importer model of the Venezuelan economy. But the lumpen Venezuelan bourgeoisie was not interested in investing to start producing on the land or in setting up an industrial infrastructure that would meet the needs of the population. On the contrary, they concentrated on political manoeuvres to try to overcome the storm and continue with their model of capital gains through imports. In 1992 there were two military uprisings that placed the military as a new actor in Venezuelan political, economic and social dynamics. The views of Chavez and much of the insurgent military concentrated between that year and 2004 on the possibility of developing a capitalism with a human face. In this perspective, the insurgent military argued that the Venezuelan lumpen bourgeoisie had no commitment to the people and that it was possible to reverse this situation with the emergence of a nationalist bourgeoisie. This was not a novelty in political terms, since Stalinism had raised it since the 1930s to stop the world revolution and Maoism had made this premise an absolute truth. The novelty lay in it being adopted by the military, and it quickly gained political hegemony in the popular imagination. That is to say, in its origins the Bolivarian Chavista movement argued for the destruction of the old lumpen bourgeoisie and the creation of the objective and subjective conditions for the emergence of a new nationalist, anti-imperialist and progressive bourgeoisie. That gave different sectors and actors who aspired to access oil income to see in this movement an opportunity. The workers, the peasants, the salaried professionals and the exploited and marginalized in general began to see in the insurgent movement a possibility of changing their destiny. Therefore, quickly and to the surprise of the establishment, they joined the movement endowing it with a sense of class that did not have until that moment. But the Bolivarian Alternative Agenda itself (1996) continued to raise the urgent task of developing a humane capitalist model. This dynamic started a process of conflict within the Bolivarian movement between the bourgeois and aspiring neo-bourgeois elements and those who lived from work. A tension that had a first insurrectional expression on April 11, 12 and 13, 2002. But that was not the culmination; it was the beginning of an open conflict for the oil income by antagonistic social classes and between sectors of the bourgeoisie. The Venezuelan left had suffered four successive defeats. The first was the guerrilla war in the 1960s. The second, the combination of forms of legal, electoral and clandestine struggles in the 1970s. The third, the failure of the combination of multiple tactics that opened the possibility to the electoral triumph for the presidency of the republic of a steelworker who many felt had betrayed his victory for a few crumbs from the powerful. Fourth, the fall of so-called actually existing socialism. An electoral left (MAS, PCV, MEP and so on) which mostly supported the candidates of the Christian Democracy in the 1990s and a radical left in the process of dissolving its organizations (PRV-PST-OR and so on) found in the Bolivarian movement a table of salvation. But the moderate and radical left was well aware that the initial aim of the Bolivarian movement was the destruction of the old bourgeoisie and the creation of conditions for the emergence of a nationalist bourgeoisie. Many consciously approached it, betting on an intensification in this process of the class contradictions that would open the door to a socialist revolution. But no one approached this encounter without being aware of this fact. The Constitutional process of 1999 was intended to establish the juridical bases that would express the new correlation of forces which existed, reflecting political and social phenomena that had taken place since 1958 and also, to open channels for a new way of constructing the nation. It was a constitution designed for a state of social justice that demanded the emergence of a new nationalist bourgeoisie, interested in developing national productive forces and not simply snatching oil revenues from its import model. It was also an effort to build legally on the aspiration that came from decades of struggle, a political model of participatory and protagonist democracy that guaranteed the expansion of the economic and social rights of the vast majority of the population. This social pact was supported by the political forces and sealed the civic-military alliance to open channels to another possible Venezuela. The Venezuelan opposition forces with their main actors, Capriles, Leopoldo López, Ramus Allup, Maria Corina Machado and so on, openly opposed the constitutional text because they were representatives of the parasitic bourgeoisie, capturing dollars from the oil revenue, which saw its power threatened. In 1999 they called for a No vote in the referendum on the charter. For this reason, the first thing they attempted to do in the coup d’état organized in 2002 was to repeal the 1999 Constitution. It is unacceptable that they nowadays claim to be its defenders, except for the fear that the constituent process of 2017 builds a new social pact in which the interests and modus vivendi and representations of the old bourgeoisie are definitively erased. It is also unusual that sectors of the radical left, which have always questioned the text of the charter because it did not break with the capitalist model, are now proposing the defence of its content and the impossibility of its reform, opposing it to the constitutional process of 2017. Their arguments indicate that there is a risk of loss of rights, thereby expressing conservatism and lack of confidence in the revolutionary possibilities of the people to generate a radicalization of the process. As Atilio Borón pointed out recently, in Venezuela the class struggle is entering a defining phase and in that perspective, the left has become conservative. Of course in all political action there are risks of counter-reforms, but if that is the place of enunciation in the struggles, then it would be better not to do politics. We prefer to be with the constituent people and dare to live their risks and assume their fate, which is our fate as workers. The recuperation of the oil industry by the Bolivarian government, concretized in terms of public policies, marked the beginning of the destruction of the old lumpen bourgeoisie. The closure of access to the currencies from the oil income was to a significant sector of that lumpen bourgeoisie an attack that they had not suffered since the beginnings of oil exploitation. For that reason they reacted violently and tried to dissolve the Bolivarian process by means of the coup d’etat of 2002. What the appropriators of Venezuelan wealth, the importing lumpen bourgeoisie did not count on was that the workers and employees came out to defend the Chavista government. The latter emerged more popular, unveiling the profound class struggle ran through Venezuelan society and impelled the Bolivarian movement, before the possibility that the rebellion of April 2002 would open the way to a revolutionary situation. This popular support enabled Chavez and a significant part of the Bolivarian Movement to turn left, in a two-year process that culminated in December 2004 with the declaration of the socialist character of the revolution. But in politics there is no empty space; as agricultural production and the industrial infrastructure were not reactivated, it was necessary to continue importing more than 90% of the products, goods and services required by the Venezuelan population. This led to the emergence of new proto-socialist associative forms such as communes, communal councils, social production enterprises or companies recuperated by their workers, while a new group of importers became converted into a neo-bourgeoisie. Thus, since 2006, strong tensions have emerged between the old lumpen bourgeoisie, deprived of access to the foreign exchange from oil income, the importing parasitic neo-bourgeoisie and the workers who embraced the socialist idea. The class struggle began a new stage. In these contradictions between capital and labour, Chávez usually placed himself at the side of the interests of the workers, but at the same time assumed himself as an arbiter to avoid direct confrontation between the antagonistic classes. The radical left was always clear in this dynamic, but it always gambled on a new correlation of forces in which the popular sectors with Chávez and the anti-capitalist Bolivarians would open the way to a radical socialist revolution. Reality usually surpasses any political lucubration. Chávez’s illness and subsequent death, as well as the sharp drop in oil prices to levels well below the minimum income required to maintain the situation of governability initiated in 2006, open a new chapter in the class struggle in Venezuela. The American empire, with its international lackey governments, and the national lumpen bourgeoisie, see that the time has come to recover the oil income to return to the model of a late, dependent and import-based capitalism that they had upheld. But the new bourgeoisie that emerged between 2006 and 2013 is not willing to give up control of 96% of the mass consumer products that are imported. In the middle there is a government and a party that had played on a new socialist multi-classism that avoided direct confrontation between antagonistic classes. Those workers who were affected by brutal inflation, loss of purchasing power and the replacement of socialist discourse by a rhetoric of survival in power, hesitate between passivity and unrestricted support for Maduro’s government. This hesitation led more than a million Chavez voters to abstain in December 2015, which made it possible for the opposition to Chavismo to win in the National Assembly. The street has re-emerged as the space for the measurement of forces. The truth is that each of the sectors in conflict, with an electorate that exceeds four million votes, can mobilize 100-200,000 people. The propaganda about the superiority of one or the other from the mobilizations does not conceal that what lies behind is an intensification of the class struggle. The sectors influenced by the right are betting on a return to the pro-capitalist model prior to 1998, a very significant group of workers influenced by Chavismo is beginning to tire of the current situation and poses a radicalization without breaking with the bureaucratic apparatuses, while the neo-bourgeoisie wants everything to remain the same so that nothing changes. The political sectors in both camps, influenced by one or another bourgeois factor, are unable to talk because both want 100% of the oil revenue. Failure to agree on how to share profits from oil revenues sharpens conflict, in a spiral of permanent tension with no possibility of exit. The political crisis is an expression of the tensions between bourgeois sectors that do not agree on how to share oil income. But for the parties of the Gran polo Patriótico (Great Patriotic Pole) and most intermediate cadres, the rank and file and elements of the leadership this dispute does not involve them, but they could be affected by its resolution which could end up being regressive in terms of political, social and economic achievements; so they begin to turn left towards an encounter with “popular logic”. The greatest risk to the establishment of this impossibility of political dialogue, given that economic interests and ambitions are overflowing, is that (a) an authoritarian solution emerges that seeks to rise above both bourgeois sectors in dispute, building roads of forced understanding: to the extent that this authoritarian exit manages to break through to an economic consensus the political solution would be eminent and the “authoritarian” one would cease to have reason to be; (B) a social revolution emerges that builds a political centre radically opposed to what was known during the twentieth century and the beginning of the twenty-first century in Venezuela. 7. Is the Constituent Assembly an opportunity to resolve the class conflict in Venezuela? The crisis in Venezuela has deepened in 2017, and is no longer only economic and political but also social, moral, cultural and fundamentally a crisis of perspective as a nation. This situation, a consequence of the long conflict explained above, is one of the peaks in terms of violence and misunderstanding since Hugo Chávez emerged at the head of the movement that has been trying to change the model of capitalist state known as the Fourth Republic almost 20 years ago. At present we are experiencing levels of daily violence that are totally unbridled, the escalation of which opens the possibility of a civil war situation as an expression of an overflow of class struggle and the beginning of a revolutionary situation, but also opens possibilities for the formation of an authoritarian government that seeks to arbitrate the bourgeois dispute, foreign military intervention to erase the bad example of Chavismo in Latin America, the Caribbean and the world, or even economic blockade with the freezing of oil accounts. Each time that friction between the social classes threatened to break the social pact of 1999, the solution of the Bolivarian movement with Chavez at its head was more democracy, expansion of popular participation or elections. These tensions have a long expression at different historical moments, perhaps the most relevant ones were expressed around the elections for the National Constituent Assembly in 1999; the recovery of control of PDVSA and the coup d’état (2002); oil sabotage and the employers’ lockout at the end of 2002; the sabotage of investment in the productive sector by the employers; electricity sabotage at different times; the economic war with the programming of food shortages, violent protests, (guarimbas, blockades of roads and industrial plants). Unfortunately at many of these times we have also witnessed abuses of authority, criminalization of protests and violations of human rights that show the tensions of the class struggle within the Bolivarian movement itself. A special aspect in the current conjuncture is the involvement of governments of other countries in our internal affairs, as is happening with the so-called Obama Decree that considers Venezuela as a country representing “a high danger for the stability of the United States”, or the claim by Almargo that the OAS intends to apply its Democratic Charter to the Bolivarian Revolution and / or impose an alleged humanitarian aid to the country. The consequences of these destabilization attempts patented abroad have generated consequences that have been left in conditions of impunity, despite the lamentable numbers of deaths and substantial material and economic losses. This street violence financed by the lumpen bourgeoisie and by foreign forces is being suffered daily, with the unfortunate outcome of numerous deaths. 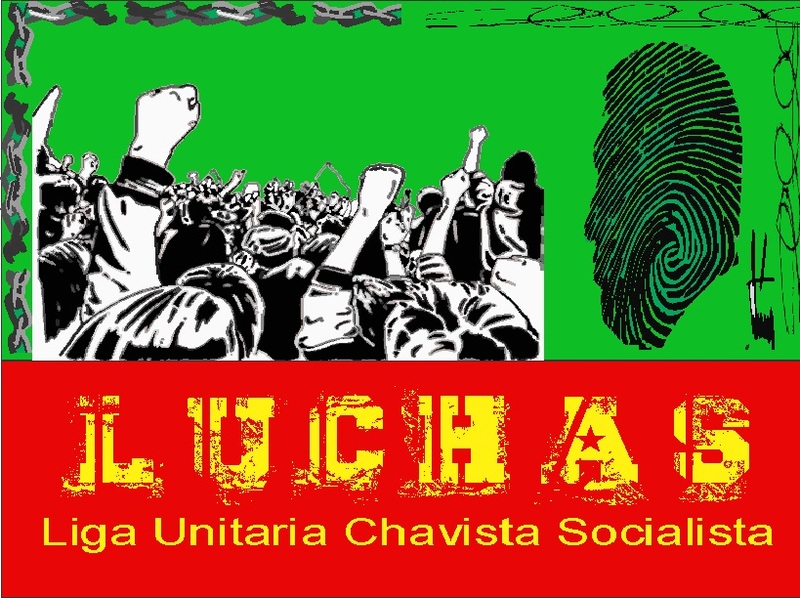 In LUCHAS we demand the immediate imprisonment and prosecution of those guilty of the murders, whoever they are and no matter what they say they defend; for us these are the children of workers and wage earners who are being manipulated or have fallen into the fray and, in order that this does not happen again, there can be no tolerance, impunity or concealment of procedural truth. The violent protests sponsored by the opposition sectors have as their sole aim the breaking of the constitutional thread through the departure by force of President Maduro from government. They disguise this with supposed democratic aspirations but what is behind it is their desperation to return to control of the currencies coming from the oil income. Therefore they have been oscillating in their demands; at the outset, demanding a disqualification and de-legitimization of President Maduro; then demanding gubernatorial elections which have been delayed as a result of the economic crisis of supply, prices and productivity. Later they began to demand general elections and a constituent process to erase the constitution of 1999. From “peaceful” protests, some for legitimate democratic rights, they immediately passed to violent expressions with vandalism, death and destruction of infrastructure. All this is manipulated to make them appear in the international media as democrats accusing the government of violating the right to protest and of being a repressor and even a murderer. All the imperial media has been put at the service of the overthrow of the Bolivarian government. Opposition violence has increased, with acts of pillage and criminality, since the Resolution of the Supreme Court of Justice (TSJ) to limit the attributions of the National Assembly, in permanent contempt and faced with a prolonged conflict of powers. The statement and position taken by the Attorney General of the Republic, Luisa Ortega Díaz, questioning the TSJ Resolutions, reinforced the spiral of violence despite the return of full powers to the Assembly. In this context, they escalated the slogans accusing the government of President Maduro of carrying out a coup, evidently to seek isolation and international condemnation, in the context of a growing influence of the right in the region. The governments of several Latin American and European countries, including Colombia, the USA, Brazil, Argentina, Paraguay, Mexico, Canada, Spain and others, are belligerently pressing the government of President Maduro for a dialogue with the opposition. This international articulation is not new, repeated attempts have been made to isolate Venezuela at a world scale. Recall the automatic solidarity of the right-wing governments with the guarimbas of 2014 known as “La Salida”, criminal violence led by Leopoldo López, which sought to effectively bring down the newly installed government of Maduro. This time, the aim is to give violent protests a “democratic cover” with the request for gubernatorial elections; the election of a new National Electoral Council; freedom for those they call “political prisoners”, first and foremost the convicted criminal Leopoldo López, judged responsible for the crimes and damage caused in the insurrectional acts that he publicly convened and directed in 2014. The call for a National Constituent Assembly has incensed the right, uncontrollably generating violence. In some states of the country, such as Carabobo, paroxysm was reached: armed gangs of criminals in different areas of the main cities of this state, controlling some housing estates and neighbourhoods, imposing looting on all types of shops, food transport and even residential housing, collecting tolls to allow the transit of citizens and even assaulting and killing humble passers-by travelling through the streets. MUD leaders, including Julio Borges, president of the National Assembly, called on the people to “rebel” and to protest against Maduro’s call for a Constituent Assembly, characterizing it as an auto-coup and a manoeuvre by Maduro to gain time and perpetuate himself in power. Sectors of the middle-class and supposedly radical left, including a former Chavez minister, who are increasingly biased by hatred in the analysis of reality rather than by a capacity for characterization of the conjuncture proper to the class struggle, have said “This call for a Constituent Assembly means a great betrayal of Chávez because the CRBV was his monumental work.” For them, “daring to change or modify the CRBV is to proceed against his legacy”, forgetting that they supported Chávez himself when he tried to modify 69 articles of the Constitution by calling a referendum, which he lost. The right, as expressed in the MUD, was in the past opposed to the reform of the Constitution because it feared a radicalization of its content that would break with the logic of capital, so it is understandable that today they oppose again. What is inexplicable is the regression of that other sector of the left that now with timorous arguments shares the tactics of the MUD. This is not a minor element in the field of class struggle. If, in a clear way that Chavez had already considered 10 years ago, the CRBV was not perfect and that, by then, changes had to be made in order to move forward, the positions of these “critical Chavistas” and the declarations of the Attorney General of the Republic, affirming to the international press that “Our constitution cannot be improved” appear ridiculous. In light of the events of violence that have arisen in recent weeks, especially in important states such as Carabobo, it seems to us that we could be a step away from a tragedy like Colombia’s “Bogotazo”, which would open a long period of violence in our country, as happened in that brother country with the killing of Jorge Eliezer Gaitan. That would be a very serious injury to Venezuelan society and would place the resolution of the class conflict in the field of the military and violent forces. For this reason, it is urgent to close the way to any attempt at an authoritarian solution, from above, to the ongoing class struggle. In this perspective we value the call for the Constituent Assembly, and from that scenario we frame our political positions in the contradictions of the class struggle. The fundamental criticism that the right makes of the call for a Constituent Process in the year 2017 is that it is not an agreement of parties, but a call to the involvement of all citizens. We point out that in the current circumstances of deepening conflict over foreign exchange from oil revenues, multi-class political parties of any kind are incompetent to reach an agreement and resolve the issue of street violence. The bourgeois elements in dispute, each for 100% of the oil income, have no chance of mediating in the conflict. Party solutions, of simple dialogue and agreement without the popular involvement of workers, housewives, students and salaried professionals are impossible because the people are a fundamental player in the current dispute. For that reason, we consider progressive the Convocation of a Constituent Assembly from the popular power as a possibility not only of a resolution of violence at the bases of society, but also as a clear path for revolutionary deepening and socialist radicalization of the process. The criticism that unites the right and some on the radical left, that the call to the constituent process is a government strategy to prolong itself in power, seems to us ancillary and cosmetic, because the substantive element is the popular role in determining the direction in use and enjoyment of the oil income. For revolutionaries it is very progressive that Maduro has said that this Constituent Assembly is: “deeply working class, communal, youthful, indigenous and for all people”! For the employers and their supporters and for the constitutionalist pontiffs of “critical Chavismo” that is a heresy against the CRBV and a gross manoeuvre by Maduro. When you are at crucial moments of the class struggle, opportunists as well as sectarians only see manoeuvres in challenges and opportunities. Nor are we deluded enough to believe that by itself the Constituent Assembly will be the magic wand that allows an end to the existing crisis. This call means a challenge for the social movement and workers, as vanguard sectors, to demonstrate their capacity for class independence vis-à-vis capital, state, and their institutions. Both the right-wing and the radical left and / or critical Chavistas oppose it, not so much for constitutional and democratic conceptions, but for mathematical questions as they have little influence on trade unions, federations, communes, communal councils and indigenous organizations. The right have some professional guilds and some student centres, but they are afraid that this accumulation is not enough, that is, the sum does not give them victory. And, for them, if they do not have a voting advantage equal to or greater than during the National Assembly elections, they consider it an early defeat for their central purposes: that Maduro should go and the CRBV that exists today is radically changed, as good hypocrites say when defending and retaking access to foreign exchange from the oil industry. In the midst of this situation of impossibility of a meeting that resolves the situation without violent conflict and the growing tensions from below for a prompt radical solution, President Maduro has taken the bold political initiative of calling for a Constituent process. This constituent process should not be seen only as a democratic development, but as a new chapter of the class struggle. In this sense, the call by President Maduro acquires a progressive character as a possibility of resolution of the conflict not by agreement between factions of the bourgeoisie, but through popular and working class self-activity. This call triggers the tensions of the class struggle. In this context, as LUCHAS we have decided to participate actively and openly in the constituent process. We ratify our critical support for the Bolivarian process and in that sense we will accompany the workers, peasants, students, women, salaried professionals, exploited and marginalized in the perspective of having a broad and legitimate representation in the great parliamentary scenario which this constituent assembly should be, so that its deputies contribute in opening the way to a revolutionary socialist radicalization of the process. Without any doubts or hesitations, we are standing alongside President Maduro stressing the role of the workers in promoting the radical socialist revolution of the Bolivarian process. The workers must be the primordial social class that together with capable professionals and revolutionaries must be at the forefront of the decision-making bodies to carry out the necessary changes and transformations. Only revolutionary actions and measures can really lead us to socialism. As a form of government, the most extensive democratic discussion must prevail in order to confront the problems of the revolution. Only in this way can the legitimacy of participatory and proactive democracy established by the CRBV be realized. The Preparatory Commission for the convening of this Constituent Assembly has said, among other things, that its objectives would be: 1) A Constituent Assembly for peace; 2) Building a new post-oil economic system; 3) Advancing more in the state of social welfare, giving constitutional rank to the missions; 4) Promoting the functioning of the system of justice and protection of the people to end impunity; 5) Promoting the new forms of participatory and protagonistic democracy, giving a constitutional role to the Communes; 6) A sovereign foreign policy; 7) Cultural identity and a new Venezuelan identity; 8) A guarantee for the future and 9) Preservation of life. These points give us a way to transcend capitalism beyond what has so far happened. But we cannot wait to install the Constituent Assembly to face the problems that hinder the support of the social bases of the process. We are for criticizing the tactical and strategic errors that have led to this crisis to the enormous magnitudes that we now suffer. We still await the “golpe de Timón” [“Change of direction”] that Chávez demanded before dying, when attempting a balance sheet of his periods of government. We must face, because the hour is late, the shortage of food and medicines, the vertiginous loss of the purchasing power of wages. The economic war, because conjunctural and structural issues were not addressed in time, has degenerated into this economic chaos that we suffer, where from the biggest to the smallest merchants, winemakers and bachaqueros put the prices that they want on products without any real price controls. Immediately, an Economic Emergency Plan should be issued, which should revive the productive apparatus to guarantee consumer and service goods and restore the purchasing power of wages. That is key to curbing the existing popular discontent. It is necessary to denounce the facts of corruption and demand that the corrupt are tried and punished; we demand the dismissal of incompetent and corrupt civil servants. It is still in the memory of many compatriots who want to know who were the supposed entrepreneurs who used more than 20 billion preferential dollars to import and only brought containers which were empty or full of waste. And, how is it that in the last four years 160 million dollars have leaked away? Likewise, the payment of the foreign debt and concessions for the exploitation of our natural resources, like the Orinoco Mining Arc, concessions of oil and gas exploitation to transnational and private companies, need to be addressed by the Constituent Assembly and should be the starting point for a citizen’s audit of the foreign debt and public spending, of a permanent nature, and with constitutional status. It will be necessary, after passing this stage of propaganda for the Constituent Assembly, to elaborate from the different social sectors programs which are economic; social; environmental; concerning citizen rights; concerning integration and regional cooperation; as well as presenting immediate proposals to guarantee peace and coexistence, which will form the basis of the debates and discussions of the Constituent Assembly. In the last two weeks a fervour among workers and other social movements has been reborn. We have witnessed dozens of assemblies of workers in different states and in different sectors, convened by affiliated unions and federations and related to the CBST trade union federation where they have already formed campaign committees for the Constituent Assembly. Events where there has been a surprising enthusiasm to continue debating everything that is there to debate. However, we must go much further. It is necessary to extend the Constituent process to the communities and the different social bases that will have representation in the Assembly, with regular and permanent meetings between these representatives and those bases from which they come. They should present accounts and assume the guidelines that the bases in democratic assemblies decide. These deputies and the rank and file have to accompany the struggles in which the workers and the different popular sectors fight for their particular rights. Above all, today there is the risk that many conflicts will develop and that hundreds of workers lose their jobs, if the employers follow the example of companies like General Motors, a corporation that has decided to “cease operations in the country” when it is evident that they want to fire 2,700 workers and return after a year or two to restart their operations. GM Corporation contributed its share of silliness to the international media campaign, informing the press that the Venezuelan government had expropriated the company. Now, as never before, the greatest class solidarity and the best expressions of revolutionary consciousness must prevail. Let us follow the advice that Leon Trotsky recommended to various organizations in the world and in different circumstances of the class struggles: “We must help the masses in the process of their daily struggle to find the bridge between their current demands and the program of socialist revolution. This bridge consists of a system of transitional demands that starts from the current conditions and the consciousness of broad layers of the working class”.